You can't beat good lighting in the bathroom. A properly placed vanity fixture can give your reflection a youthful glow and make it easier to do your morning routine. The height and positioning of the lights you use above your vanity play a major role in just how well your space is illuminated. 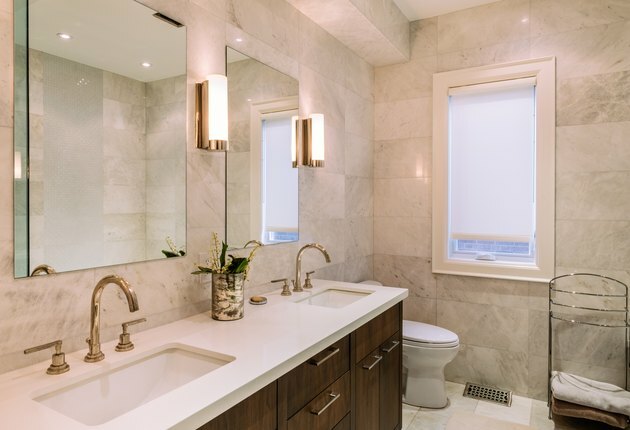 Bathroom vanity light placement is about more than looks. It's also about functionality. If your bathroom has an overhead fixture, it's considered ambient lighting. It's the general light that filters throughout the room, but it's often not enough to get a good look at yourself in the mirror. That's where vanity lights come in. Vanity lights are considered task lighting because you rely on the brightness for grooming while standing at your vanity. The height and type of task lighting can determine the effectiveness of the lighting. Lights directly over your head, such as recessed lights placed in the ceiling, make it tough to see what you're doing because you get lots of shadows on your face. Fixtures mounted on the wall above the mirror can also cause shadows if they're not installed well. Lights mounted along the sides of the mirror offer the best illumination because they don't cause shadows. However, the height is still important. You want the fixtures to hang so they cast light across your face, not from above or below. Sconce lighting on either side of the mirror offers the best light for getting ready and looking at your reflection. The light crosses your face evenly from both sides to give you a bright, clear look at your face in the mirror without shadows. Position the center of each sconce at roughly eye height. Since people's heights vary, eye height is different for everyone. A typical bathroom sconce height is between 65 and 70 inches from the floor. If everyone who uses the mirror is a lot shorter or taller, you can adjust the height based on that. Avoid installing side lights at a lower height in a kids' bathroom. Using a standard height might make the lights low for now, but it's much easier as your kids grow to have the lights at a standard height. The spacing between the two sconces is also important. If they're too far apart, you can get dark spots in the middle, right where your mirror hangs. The ideal distance between sconces is 36 to 40 inches. Sconces or vertical fixtures on either side of the mirror or medicine cabinet aren't always possible. You might have a narrow bathroom without extra space on the side, or your mirror might be so large that the sconce placement won't work. In those situations, a wall-mounted vanity fixture above the mirror is an option. Install the light above the medicine cabinet or mirror at a height of about 75 to 80 inches from the floor. You can also use the vanity as a guide. Place the light about 40 inches above the top of your vanity. The bathroom mirror height can affect that measurement if it's oversized or hangs higher or lower than normal. Adjust the height as necessary based on the mirror positioning. To minimize shadows, choose a fixture that doesn't stick out too far. This will cut down on light hitting the top of your head and creating shadows. The bathroom vanity light height impacts how well you can see your reflection. Follow standard height guidelines with adjustments to fit your space for the best results. How Far Above a Backsplash Should a Mirror Hang?